Remember in all cases if you require any additional help then please call 08434 590 877 where our staff will provide you assistance. Our offices are open 7 days a week and are open from 9am until 7pm. Who is covered, the individual or the vehicle? Car hire contracts are between the rental company and the individual and additional insurance is required if you wish to have more than one driver. With regards to the car hire excess waiver insurance the policies are also for the individual however we can cover other drivers for an additional fee provided they reside at the same address. What's the maximum and minimum age you will cover? We will cover adults up to the age of 84. This is based on the maximum age at the time when the rental begins. The minimum age for a renter is 21. They must be a minimum of 21 years of age when they pick up the vehicle. Can you define the areas of cover? 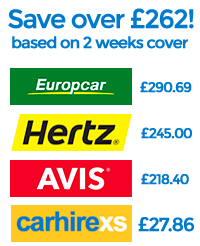 This car hire excess waiver insurance policy defines the territorial area of Europe as the continent of Europe, west of the Ural mountains, islands in the Mediterranean, Morocco, Tunisia, Turkey, the Canary Islands, Madeira and the Azores and your home country. Single trip or Annual, what's the difference? A single trip will cover you for a specified journey. It will commence at the moment you pick up the car and will cease upon the return of the vehicle. An annual multi trip policy allows you to use it as often as you wish in one calendar year provided that no rental period is longer than 31 days in duration. The policy starts on a date specified by a client and then expires 1 year later and will cover any trips booked and made during this period. Any person aged between 21 and 84 years inclusive who holds a valid or internationally recognised driving licence and is eligible to rent and drive the vehicle and able to adhere to the terms of the car hire agreement. What vehicles won't you cover? The rental of "expensive or exotic" vehicles, namely vehicles with a retail purchase price in excess of £50,000 and "antique" vehicles which are over 20 years old or which have not been manufactured for 10 years or more. Also the rental of certain vehicles namely, motor homes, trailers or caravans, vans with an unladen weight of more than 3.5 tonnes, trucks, non-passenger carrying vehicles, vehicles that carry more than 9 people including the driver, motorcycles, mopeds, motorbikes, off-road vehicles and recreational vehicles.